There was supposed to be an introductory post here. Was supposed to be … Cause there is nothing else that needs to be said when a heavenly combo of chocolate and dulce de leche appears. There are some recipes that need no further advertisement as there are some people who’s recipes are always no-fail showstoppers. 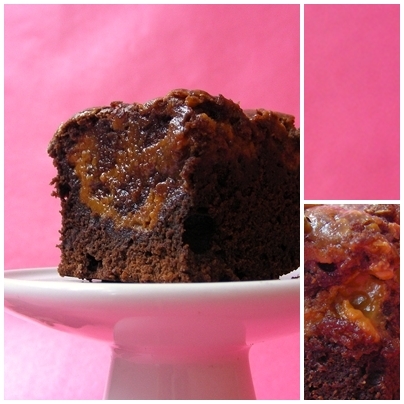 This amazing brownie recipe I have found on David Lebovitz blog. I must say it’s an evil place, makes you salivate and crave for goodies but worst of all there is some voodoo magic going on that will shrink all your clothes at a glance. Beware…. 1. Preheat the oven to 175C. Prepare 20cm square pan – grease it well, you can use aluminium foil or baking paper for lining. 2.Melt the butter and add the chocolate pieces. Once everything has melted remove from heat and whisk in the cocoa powder until smooth. Add in the eggs one at a time, stir in the sugar, vanilla and then the flour. Mix in the nuts, if using. 3. Scrape half of the batter into the prepared pan. Drop one-third of the Dulce de Leche over the brownie batter, then drag a knife through to swirl it slightly. Spread the remaining brownie batter over, then drop spoonfuls of the remaining Dulce de Leche in dollops over the top of the brownie batter. Use a knife to swirl the Dulce de Leche slightly. This entry was posted in Cakes, Sweets and tagged brownie, brownies, cake, chocolate, cocoa, David Lebovitz, dessert, dulce de lece, food, Sweets by No Onion Please. Bookmark the permalink. Hi, I love chocolate and this is interesting. Will add this in my to do list. Nice to know you 🙂 and like to link you. Those brownies look so good! 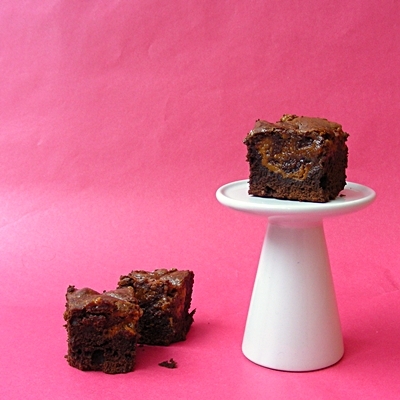 These dulce de leCHE brownies are beautiful and scrumptious-looking. Maybe it won’t make it that far, now that I’ve seen your recipe! Oooh, these look so moist and decadent! Yum! I really like your blog. Beautiful photography! You know I am not sure I have ever had dulce de leche. What am I thinking?!! I will need to see if I can find it canned in Vancouver. They look so mouthwatering! Plus I definitely think walnuts or pecans would be a great addition as you suggest. I’ve had David’s brownie recipe printed out for months now to try, but I just haven’t had the time to really bake anything. But I think, after seeing your mouthwatering photos, this will be the weekend!